By applying the conditional formatting to your project list, you can quickly highlight the project information that meets certain conditions. This feature can be used as a warning system for the project control and displays a critical data. In the project list, on the Start tab, in the Current View group, click Conditional Formatting. The following part describes each of these formatting type by using the examples. In this example the projects will be displayed in red, if their actual expenses are greater than a specified value. On the side panel, in the Condition area, in the Column field select Total Expenses (Actual). In the Condition field choose an argument Greater than. In the Value 1 field enter a value for comparison, e.g. 5000. In the Format area define the formatting, e.g. BackColor red. All projects with the actual expenses are marked in red, if they meet this rule, i.e. their content is greater than a specified limit value. The extended formatting allows to compare different fields from the project list by using different formula. This example shows you how to use a formula to format a cell. Two fields actual and planned expenses will be compared. On the side panel, in the Condition area, in the Expression field, click Select a formula . It invokes the Expression Editor dialog box, which allows you to specify an expression that will be used to obtain calcualted field values. Here you can construct the required expression. 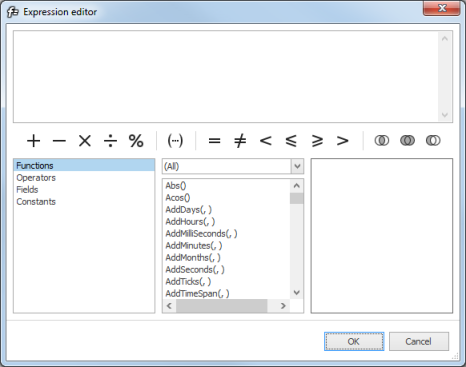 On the Expression editor dialog box, in the lower left, click Fields. Right from it select Total Expenses (Actual) from the list by double-clicking it. Select one relational operator, e.g. greater than >. Now select Total Expenses (Plan) from the list by double-clicking it. In the Format area select BackColor, e.g. green. The defined formatting will be applyed on those projects, where the actual expenses a greater than the planned one. Activate the check box Apply for cell in order to format the whole cell of the project in the project list. The most preconfigured formatting in the drop-down menu are set by default. All conditional formatting you have created are saved automatically as templates under preconfigured formatting. If you want to remove a template, click it and then click Delete Formatting below on the side panel. How to apply conditional formatting in InLoox PM 8 • Copyright 1999-2019 © InLoox, Inc. All rights reserved.